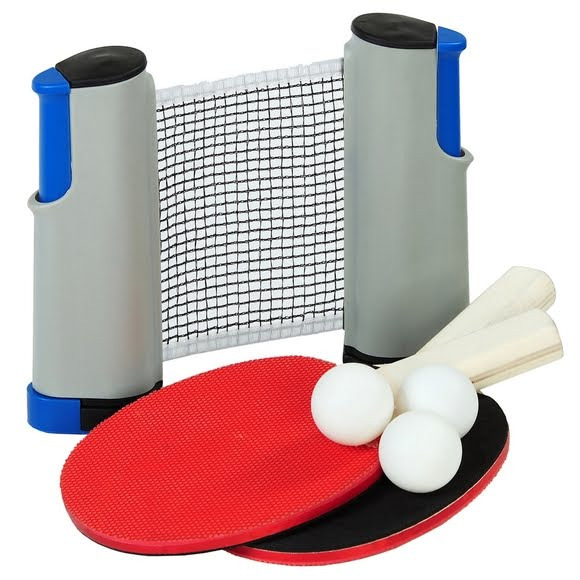 This one-of-a-kind Backpack GSI Outdoors Table Tennis Set features authentic style table tennis paddles, 3 table tennis balls and 1 net with adjustable posts. For use on a smooth, flat table top surface, you can play at home or take it on the go for all your adventures. A great way to inject a little friendly competition into your down-time, the included net will fit most tables up to 1.75 in. This one-of-a-kind Backpack GSI Outdoors Table Tennis Set features authentic style table tennis paddles, 3 table tennis balls and 1 net with adjustable posts. For use on a smooth, flat table top surface, you can play at home or take it on the go for all your adventures. A great way to inject a little friendly competition into your down-time, the included net will fit most tables up to 1.75 in. thick.